Oh, my! Have I got a heavenly cookie for you today. Mrs. Field’s White Chocolate Chip Cookie Copycat Recipe is all you desire in a cookie. It’s loaded with white chocolate chips–1 1/2 bags–so, 50% more than most chocolate chip cookie recipes. 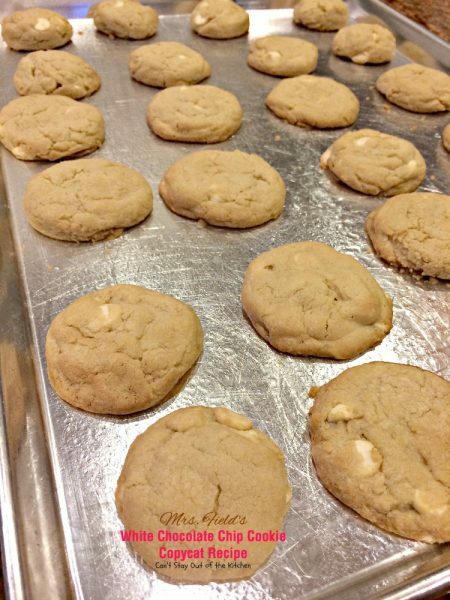 While Mrs. Field’s cookies usually use grated white chocolate in her cookies, these have white chocolate chips instead, so they are a little bit easier to make up. 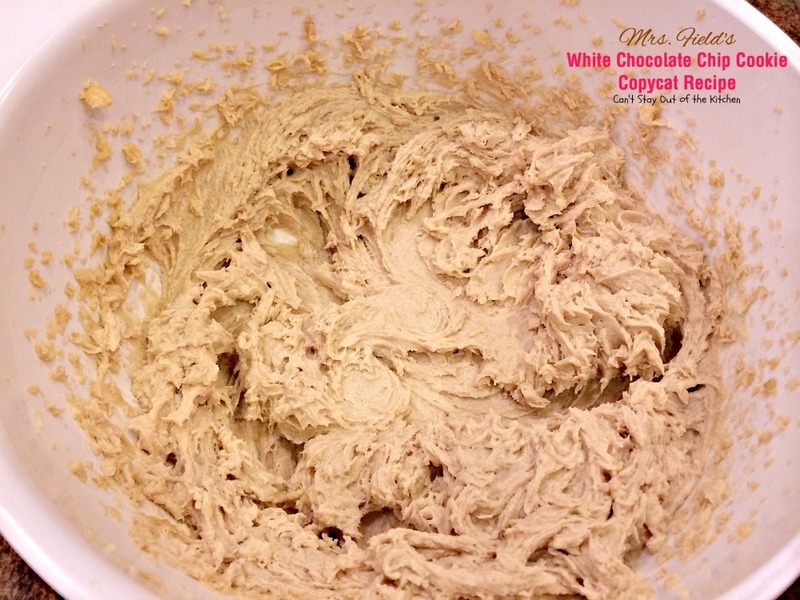 Mrs. Field’s White Chocolate Chip Cookie Copycat Recipe is inspired from my Mrs. Field’s Chocolate Chip Cookie Copycat Recipe that I published in September of 2013. While I used that same basic copycat recipe from Todd Wilbur, this time I made no attempt to try to bake these cookies in 9 minutes like his original recipe indicates. My oven is notoriously slow so I end up with cookie dough if I do that. 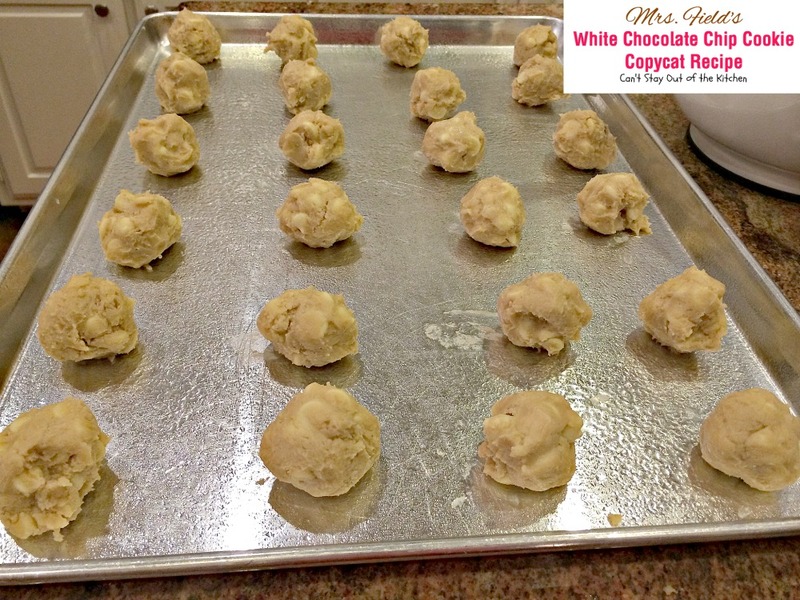 I baked these cookies until they were done–which for my oven meant 12-15 minutes. I use REAL unsalted butter and REAL vanilla extract in the recipe–no cheap imitations. 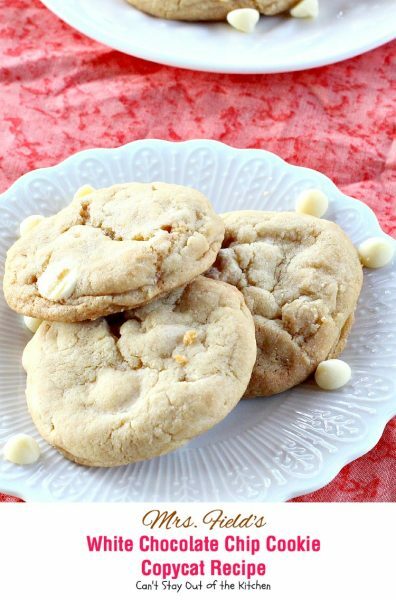 This recipe calls for REAL white chocolate chips, too. Not vanilla chips or premiere white baking chips. They are not the same. White chips do not have cocoa in them, thus, they are not chocolate! 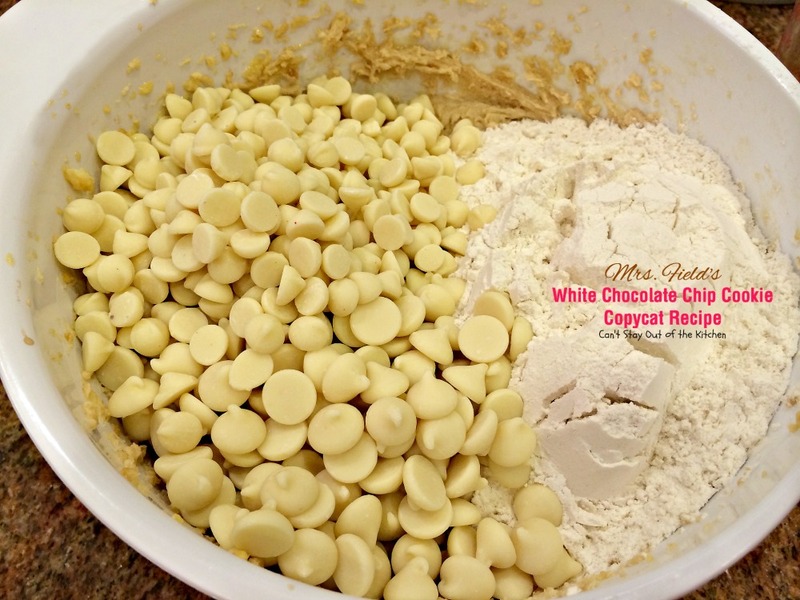 If you wanted to grate up a white chocolate bar or two, those would also work in this recipe. I really like these cookies. They have the right amount of flour so the cookies don’t run together on the baking sheet, yet they’re not tough from too much flour either. They have plenty of sugar so the cookies are really sweet. 🙂 They also have a really nice texture. I bake my cookies so they are a little crispy on the outside but chewy and gooey on the inside. Drool. 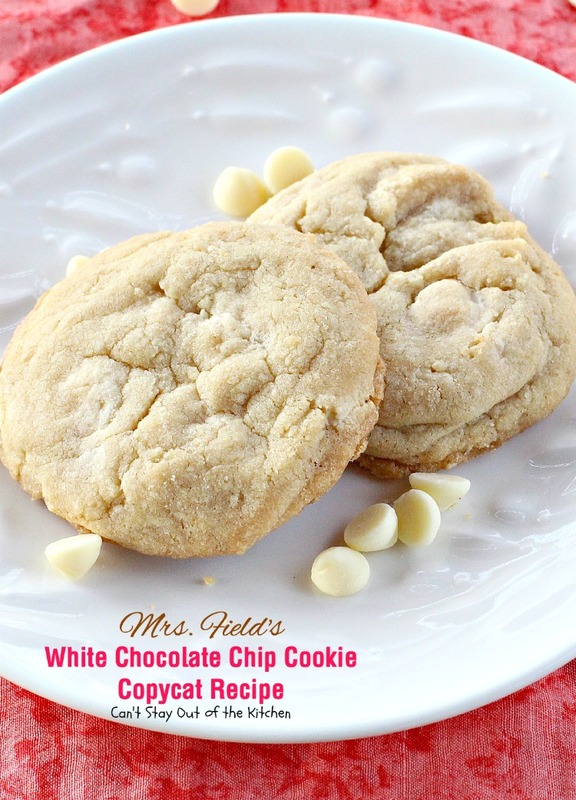 If you’re looking for a sensational recipe to wow your family or friends, then look no farther than Mrs. Field’s White Chocolate Chip Cookie Copycat Recipe. You will be in seventh heaven as you ingest these lovely morsels. In fact, I think you’ll probably keep coming back to the cookie jar–over and over again. 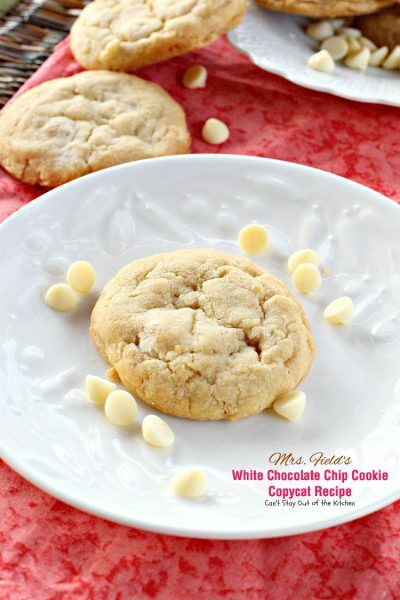 Mrs. Field’s White Chocolate Chip Cookie Copycat Recipe makes some of the best cookies you’ll ever eat! This recipe has 50% more white chocolate chips than most recipes so it’s really loaded with chocolate. Mrs. Field’s White Chocolate Chip Cookie Copycat Recipe is one you’ll want to put on your holiday baking list for later this year! Place softened butter in a mixing bowl. 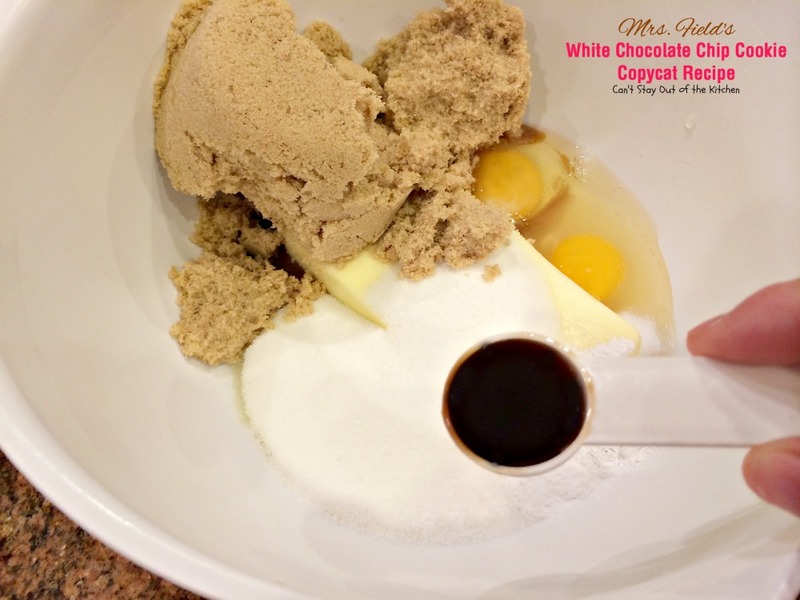 Add sugar, brown sugar, eggs, salt, baking soda, baking powder and vanilla. Add UNBLEACHED all-purpose flour. Bleached flour toughens baked goods. 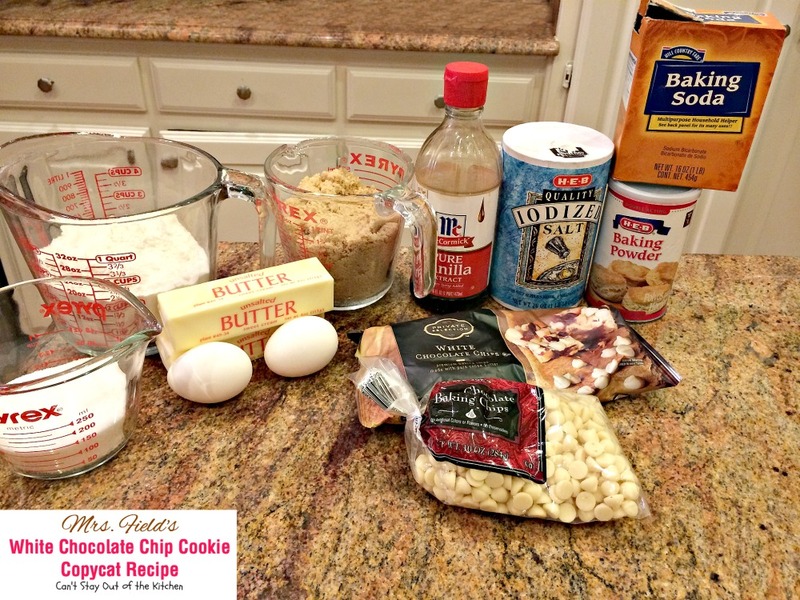 Add white chocolate chips NOT vanilla or premiere white baking chips. Bake cookies at 350 for 12-15 minutes or until done. Set a couple of cookies out for your afternoon snack! I bake Mrs. Field’s White Chocolate Chip Cookie Copycat Recipe until the cookies are done, not underdone, like the original recipe calls for. But if you want a softer cookie, then bake these cookies between 9-11 minutes. 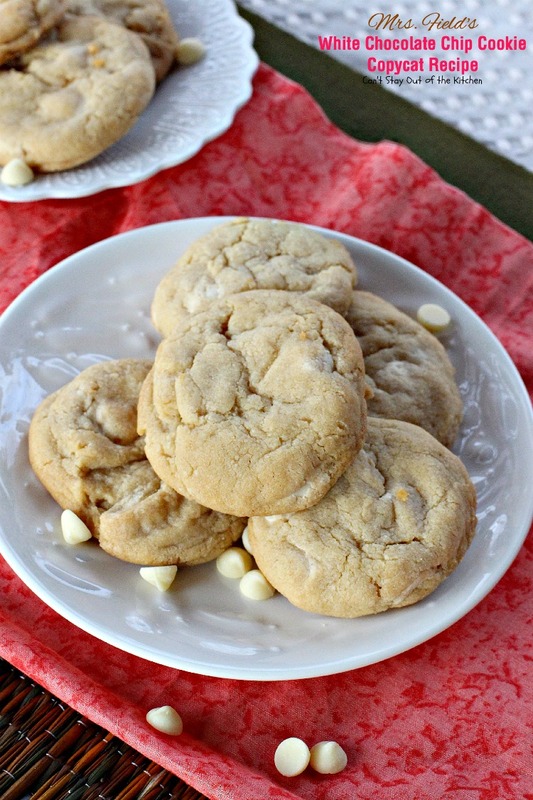 This amazing cookie is a copycat recipe from Mrs. Field's White Chocolate Chip Cookies. These cookies have 50% more white chocolate chips than most recipes, making these cookies richer and more decadent than ever! 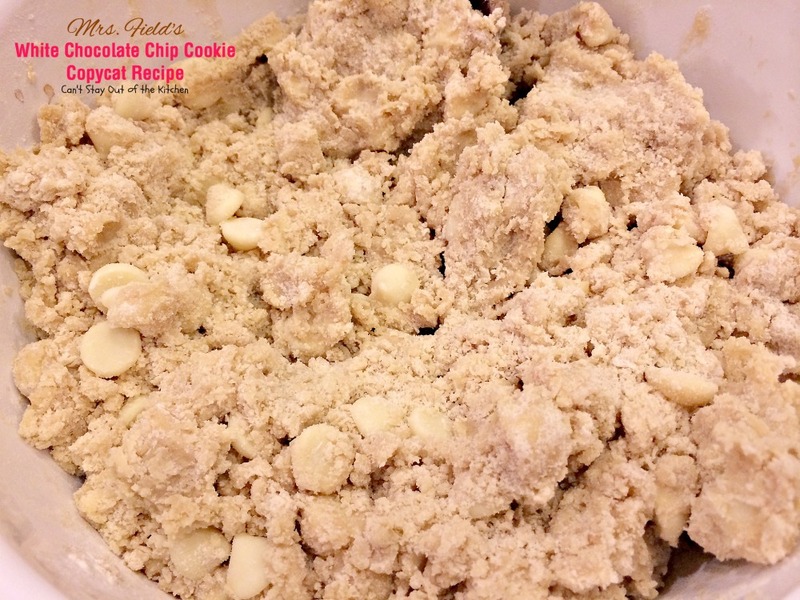 Stir in flour and white chocolate chips with a wooden spoon to combine. Shape dough with hands into golf ball-sized dough balls and place a couple inches apart on cookie sheets that have been sprayed with cooking spray. Bake for 12-15 minutes or until edges are light brown. I rotated racks every 4 minutes. 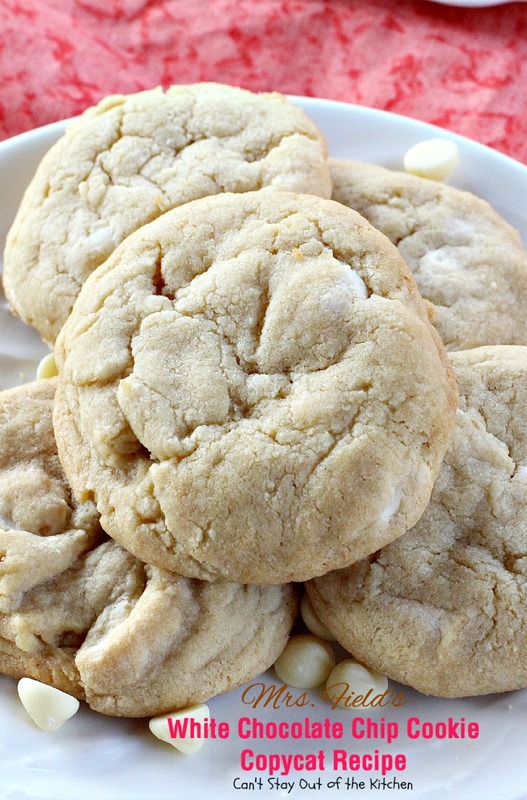 NOTE: If you want a softer cookie, then bake these cookies between 9-11 minutes. Recipe inspired from Todd Wilbur's Top Secret Recipes. 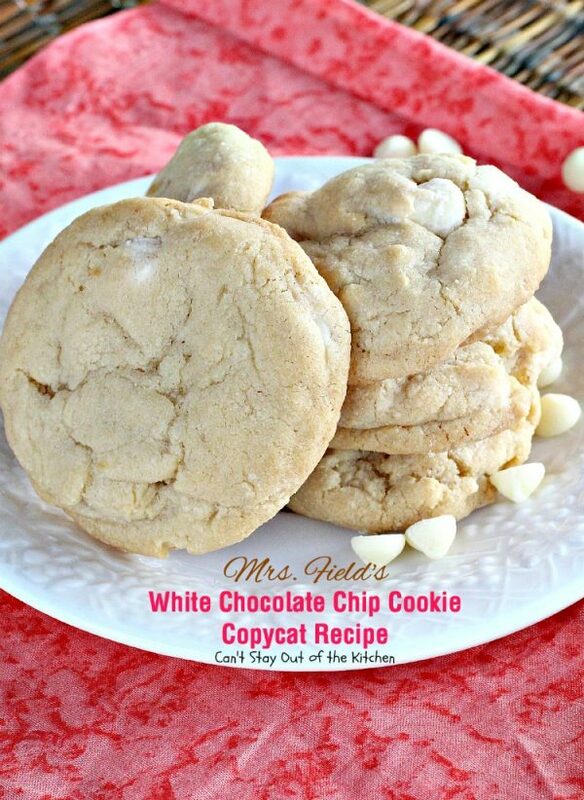 This amazing cookie is a copycat recipe from Mrs. Field’s White Chocolate Chip Cookies. 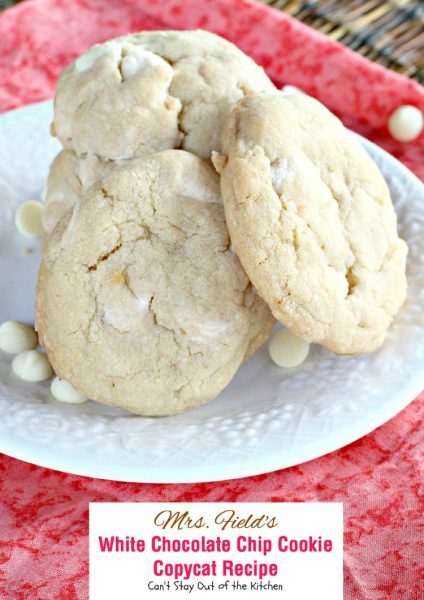 These cookies have 50% more white chocolate chips than most recipes, making these cookies richer and more decadent than ever! If you want a softer cookie, then bake these cookies between 9-11 minutes. You’ll be drooling after one bite of these sensational cookies! 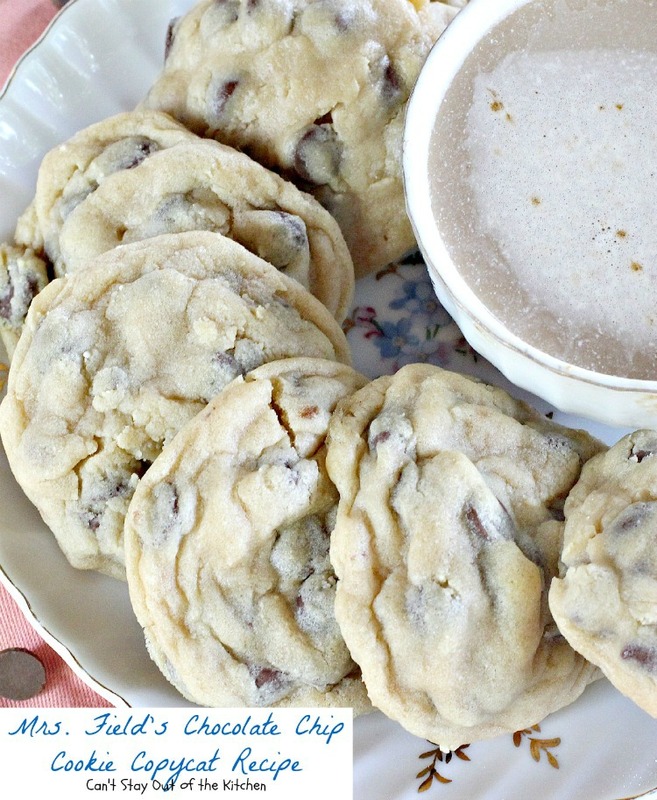 Mrs. Field’s White Chocolate Chip Cookie Copycat Recipe is something special. You’d better have a taste! Thanks, Amanda. If you cook them a minute or two less (while still rising) they are really gooey, too. Thanks for stopping by.